Genesis Alien Storm in 13:58.35 by martandelus. 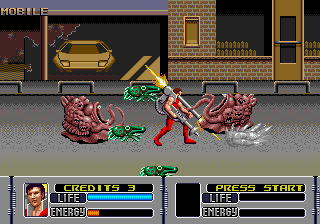 Alien Storm is a 1990 beat 'em up arcade game by Sega.The aliens are invading Earth, and it's up to the "Alien Busters" to wipe them out and destroy their creator. Watch as martandelus completely destroys all those dang aliens with the power of the Ghostbuster's proton backpack.